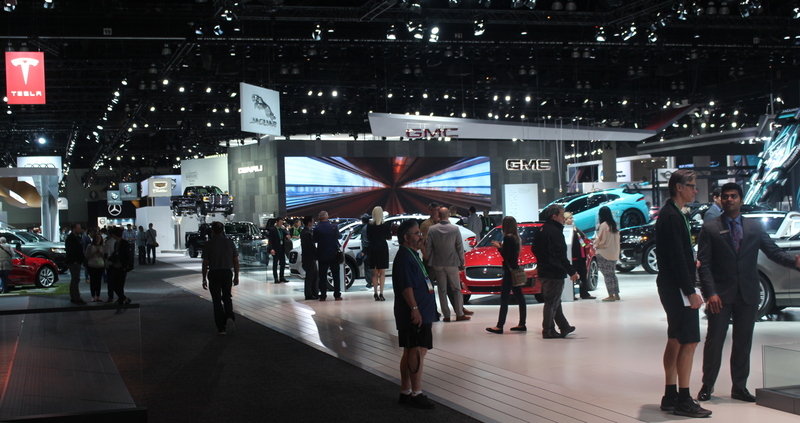 Often large auto shows have a theme: performance, environmentalism, the future. In the case of the LA Auto Show, they have been rebranding themselves as "Automobility" with autonomous cars their theme, fitting to a city where driving consists mainly moving at snails pace or reading a book while waiting for the 405 to clear. Alfa Romeo Does... well, what they do best. Restomods, Customs and Rods, Oh My! This Shelby GT350 S is very subtle, but you'll notice large drilled disc brakes, a side exhaust outlet and in front a front-mounted electric radiator fan (not shown). 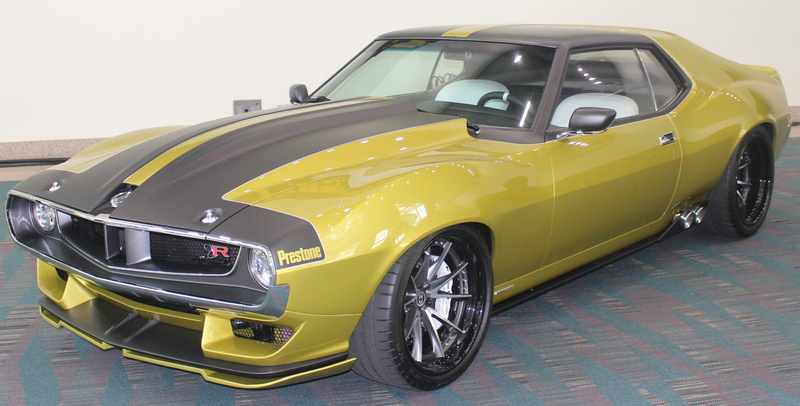 This 1972 Javelin has a 1000+ horsepower Chrysler Hellcat V8, brakes and suspension to match. Restomod means putting modern powertrain, brakes and suspension in a classic body. 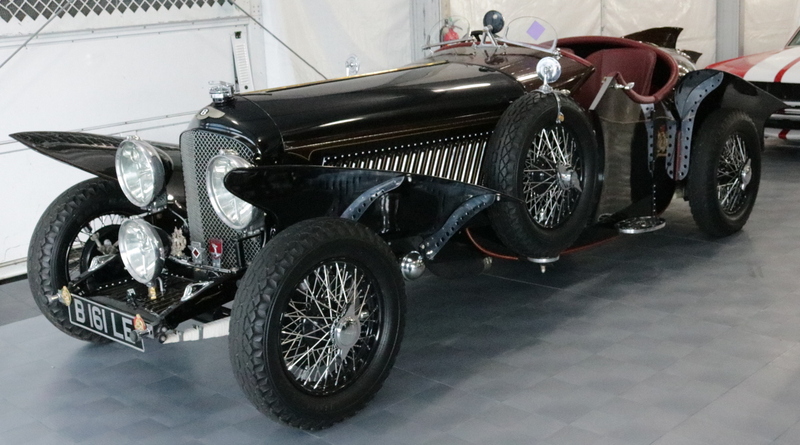 Here, the Ringbrothers modified the original body as well, all for a special vehicle to celebrate Prestone's 90th anniversary. This second Ringbrothers car at the show is a 1971 Pantera. 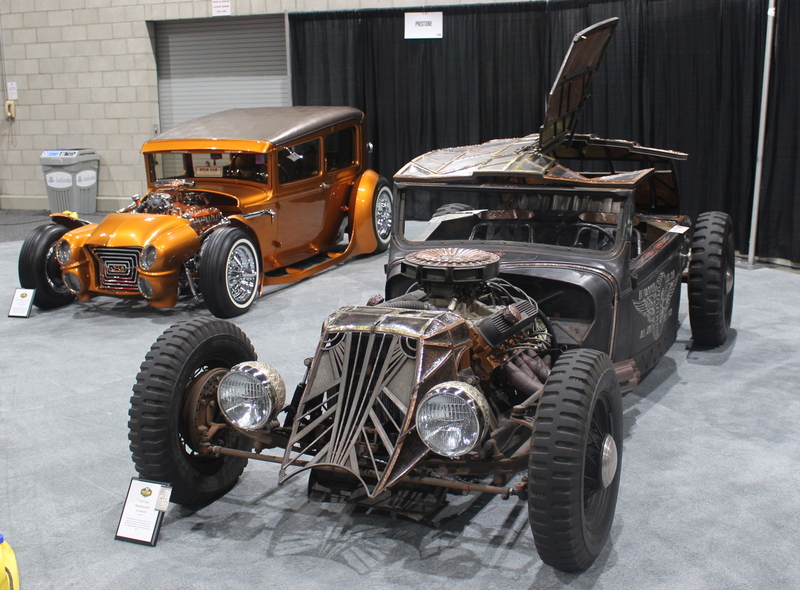 Two Fords (1930 and 1936) and two different interpretations. 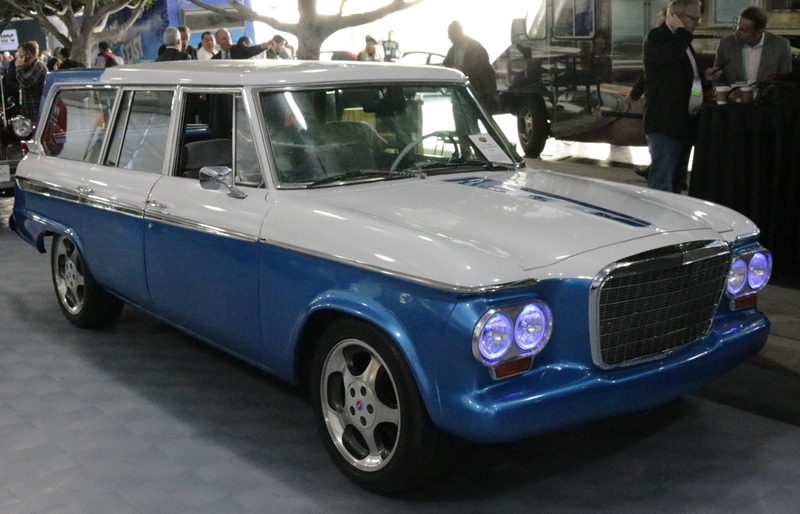 This 1963 Studebaker makes for a great custom. 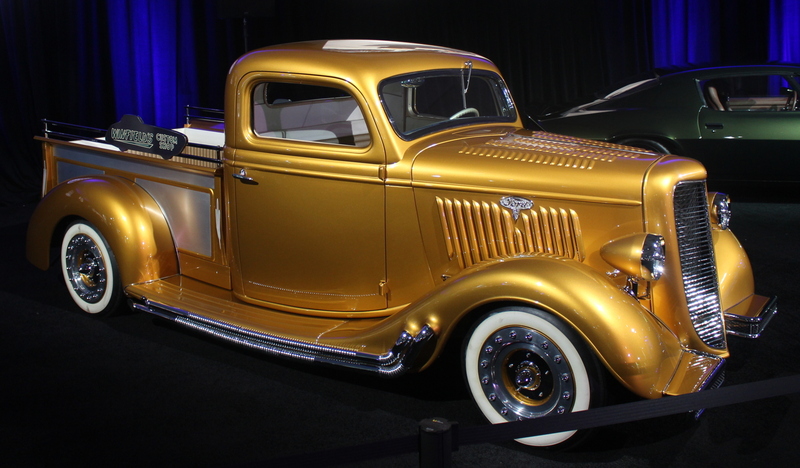 The Galpin Ford display never disappoints; case in point: this 1935 Custom Ford Pickup. 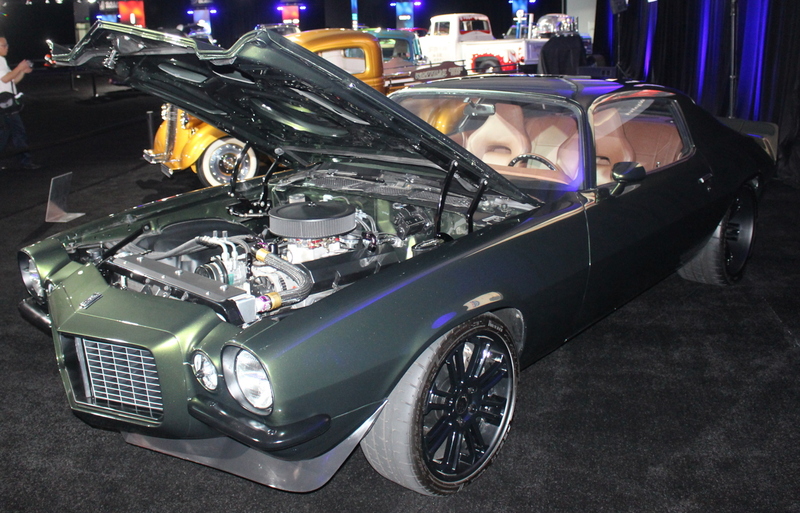 Or this custom 1970 Camaro. 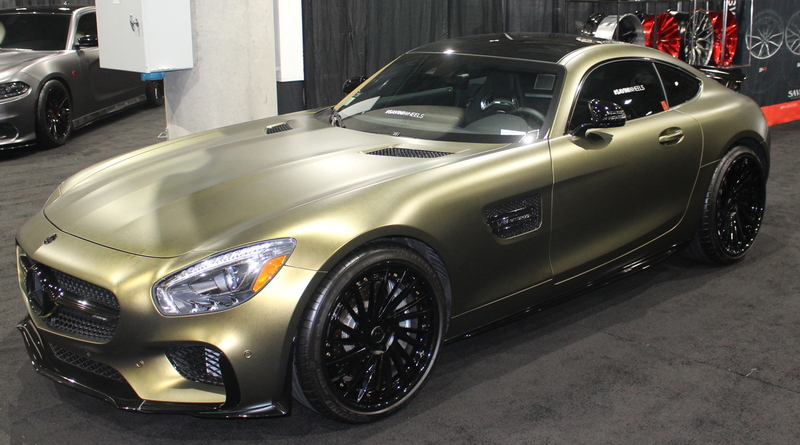 Wheel companies like to use fancy cars to showcase their wares, like this Mercedes-AMG GT with Santini Wheels. 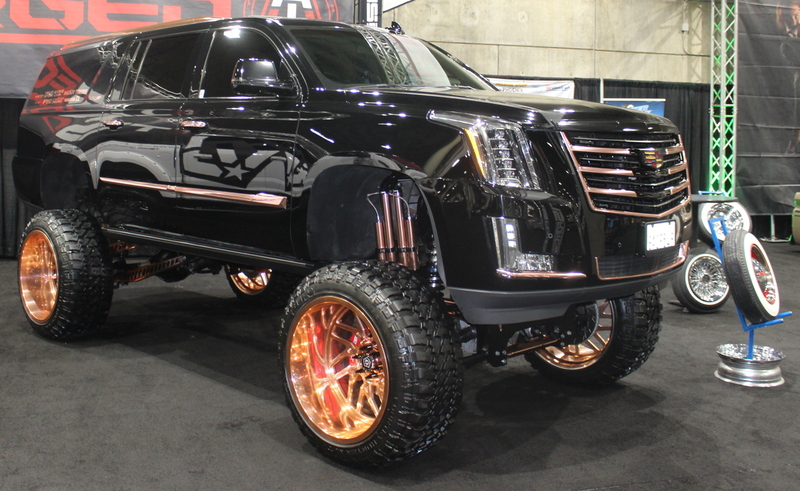 Or this Cadillac Escalade custom for TIS Wheels. 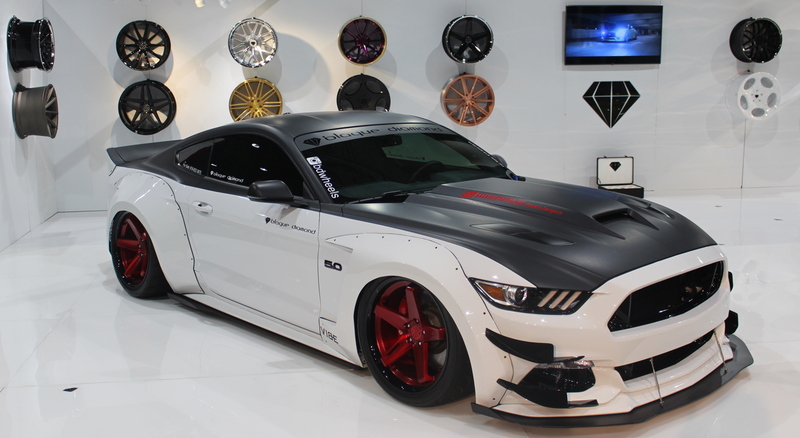 Or this Mustang custom featuring Blaque Diamonds Wheels. 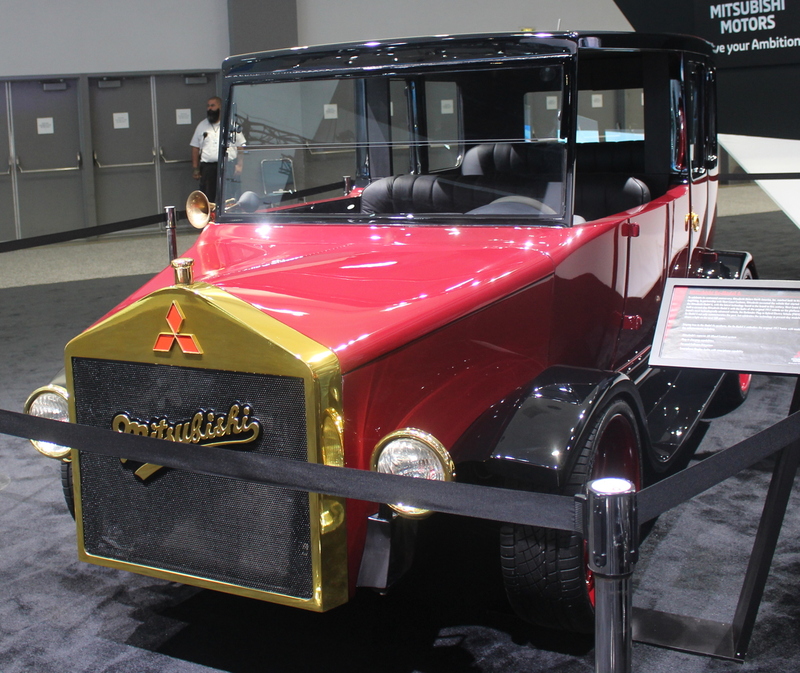 West Coast Customs built this one-off custom to commemorate Mitsubishi's 100th anniversary. With an original 1917 Mitsubishi Model A frame and powertrain and other running gear from the new Outlander PHEV, this melding of old and new can run on electricity alone, or fire its gasoline engine. 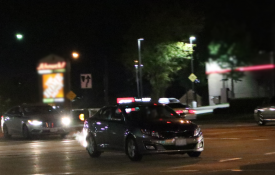 It also has Forward Collision Mitigation and other modern active safety features. The "Mitsubishi" script is reminiscent of the "Oldsmobile" logo at the time. And finally, there's this 1964 Ford Falcon Sprint. Car manufacturers love to show off the cars that win on Sunday, hopefully helping to sell on Monday. Team Joust's Mazda Motorsports Prototype Race Car, powered by a 600-horsepower 2.0-liter turbocharged 4-cylinder. 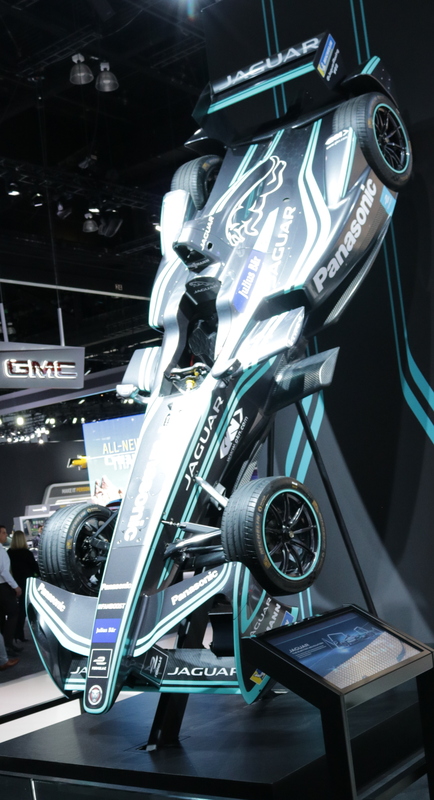 Developed for the all-electric Formula E, it makes 270 horsepower and can accelerate from 0 to 62 MPH (100 KPH) in under 3 seconds. The 2018 RLX gets a facelift, with the new, beak-free grille as the most prominent change. A new hood, new vents in front of the front wheels and new taillights complete the look. 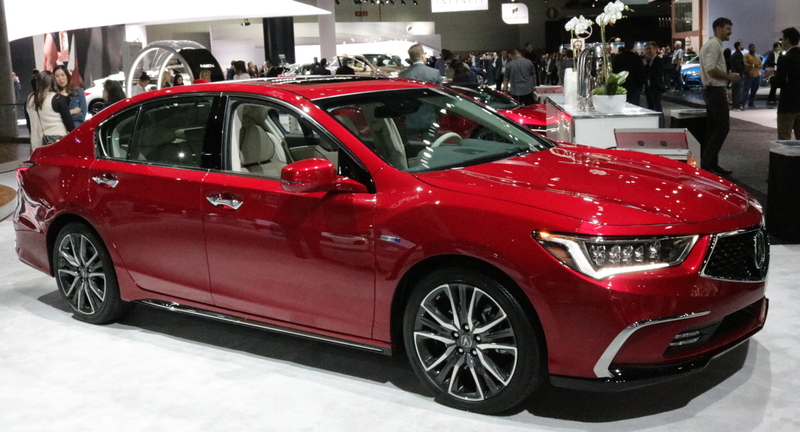 The LA Auto Show is the first show where the 2018 RLX appears. The 2019 A8 sees its US premiere in Los Angeles, it will offer a turbocharged 3.0-liter mild hybrid V6. 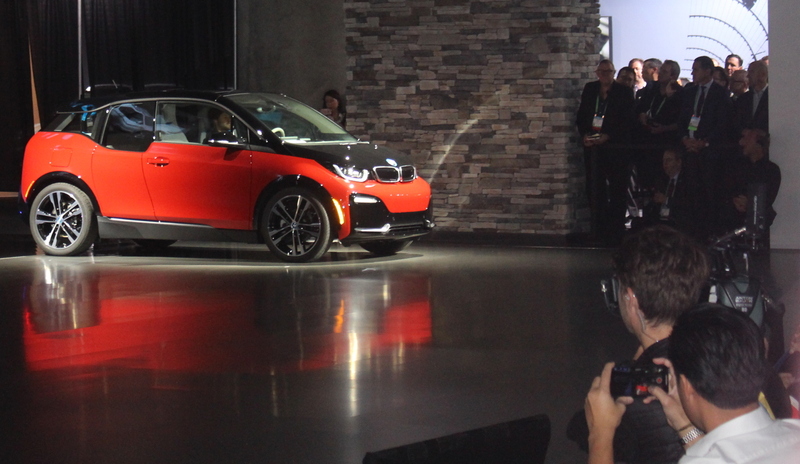 The all-electric BMW gets a sport version with 11 more horsepower (181), wider track and other enhancements. Like the standard model, it is offered with a 2-cylinder gasoline range-extender. 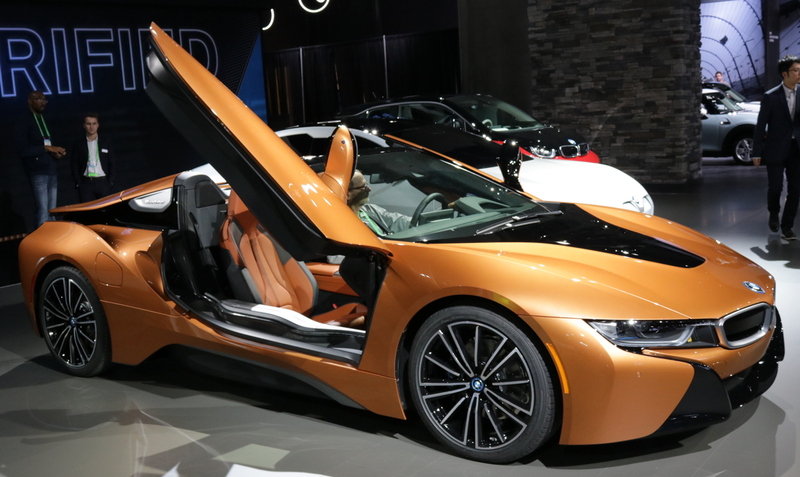 Seen for the first time, the BMW i8 Roadster retains the scissor doors of the coupe model. The i8 will take a break for the 2018 model yer, and the coupe and roadster will be appearing in dealerships for the 2019 model year with more horsepower (369, total). The next-generation BMW 5 Series now has a full M5 version with 600 horsepower from a 4.4-liter twin turbocharged V8. This will be the first M5 with xDrive all-wheel-drive. It's priced at $103,595. 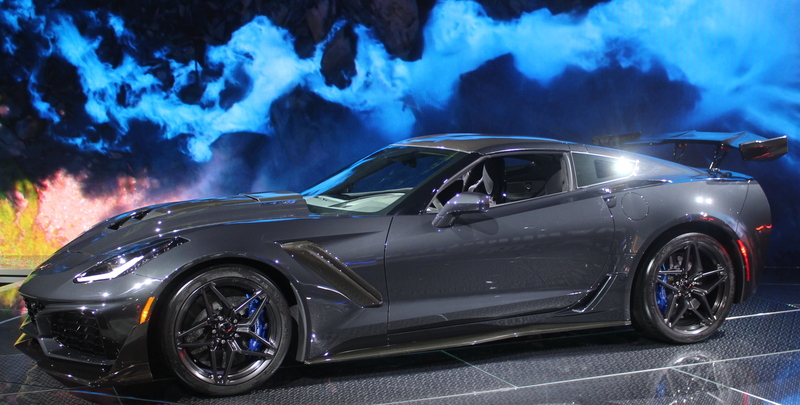 The 2019 Corvette ZR12 was one of the most anticipated unveilings for LA. With 755 horsepower, this car puts everyone on notice and helps make people forget the worst kept GM secret: the upcoming mid-engine Corvette. 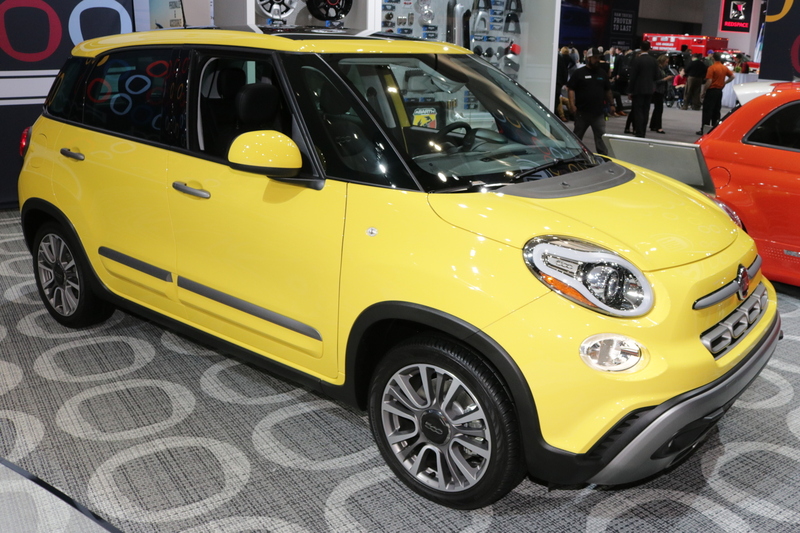 A mild refresh for this "large" Fiat is here at the show. The Ford GT is always a hit. 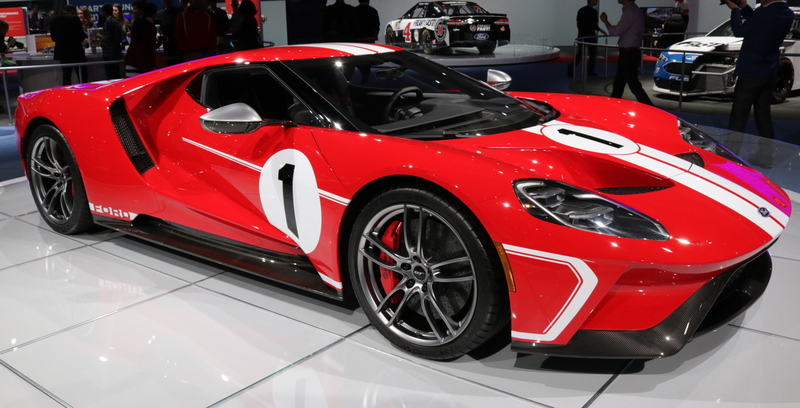 Here's a new 2018 model, a special edition commemorating Ford's 1967 Le Mans victory. Everyone is jumping on the miniature sport utility bandwagon. 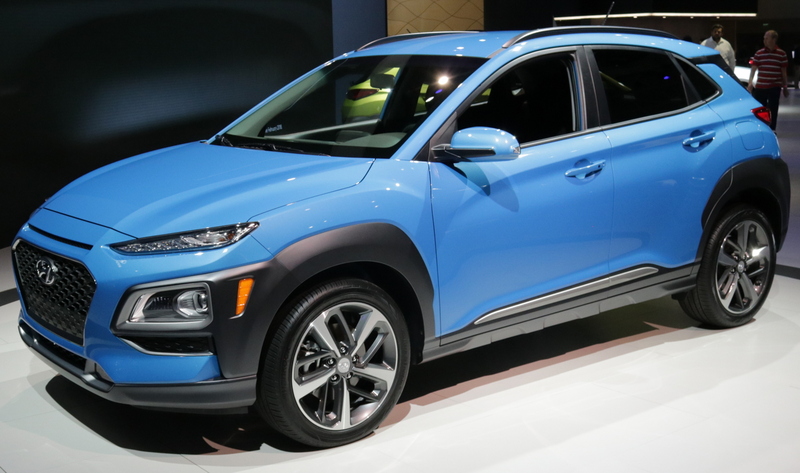 Here is Hyundai's, available with 2.0-liter 4-cylinder or a 1.6-liter turbo and available all-wheel-drive. 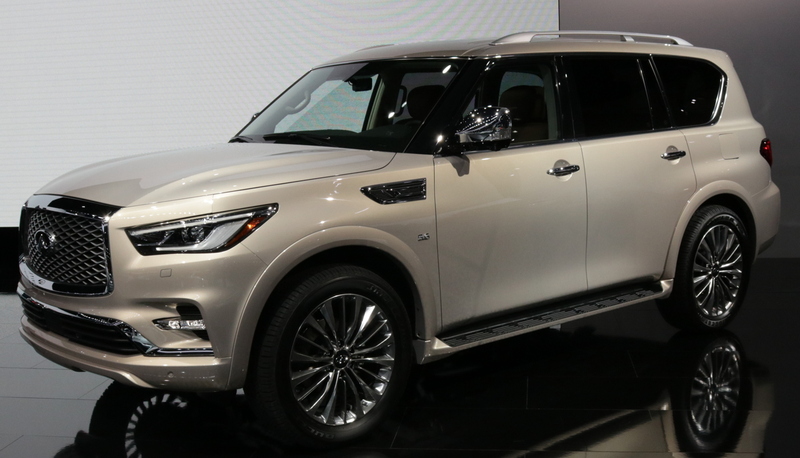 A full exterior refresh of the Infiniti QX80 had its first auto show appearance in the U.S. in Los Angeles. The big news for Infiniti is this completely new 2019 QX50. It goes from a rear-wheel-drive to a front-wheel-drive chassis and gets a first-ever production engine that can vary its compression ratio (how much the combustion mixture is compressed before ignition). Also new: several self-driving technologies rolled together and dubbed "ProPILOT." Rocker-shaft changes angle of connecting rod, changing the compression ratio of the engine; high-compression for efficiency, low compression along with higher turbo boost for power. The single biggest reveal at the 2017 LA Auto Show was the all-new 2018 Jeep Wrangler JL. When FCA did reveal them, we weren't disappointed. 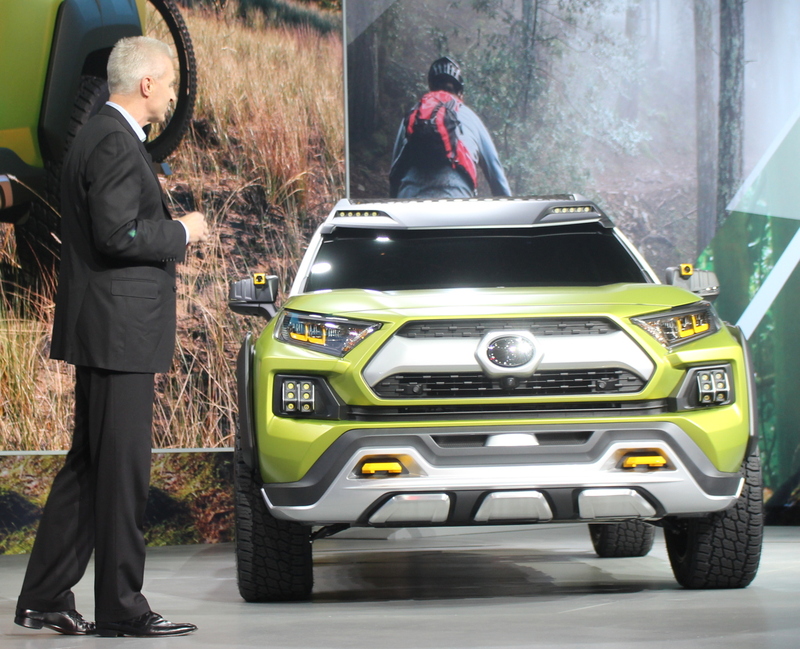 Three engines, including an upcoming diesel, 8-speed automatics (or six-speed manuals), available power-retractable roofs, Rubicons get 33-inch tires and the windshield still folds. An exterior refresh is backed up by an available 8-speed automatic (with the available V6), wireless phone charging, Driver Attention Warning, Lane Keep Assist and a Surround Sound stereo. 7-Passenger seating is now standard. 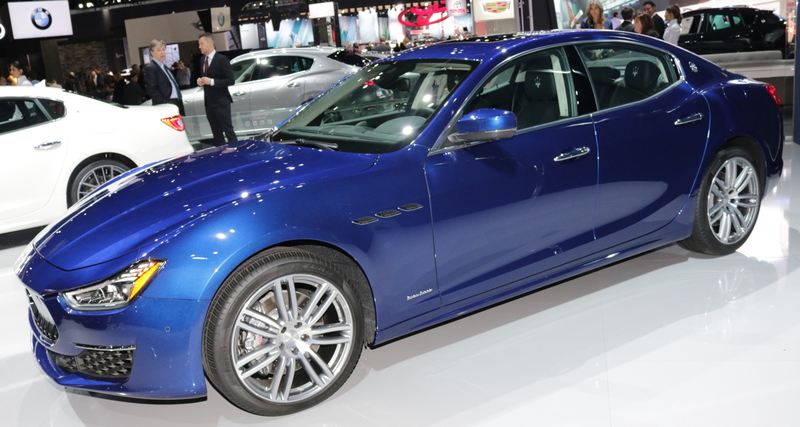 The 2.0-liter turbocharged engine is discontinued, leaving a 2.4-liter 4-cylinder and the 3.3 V6. A diesel engine is being developed. 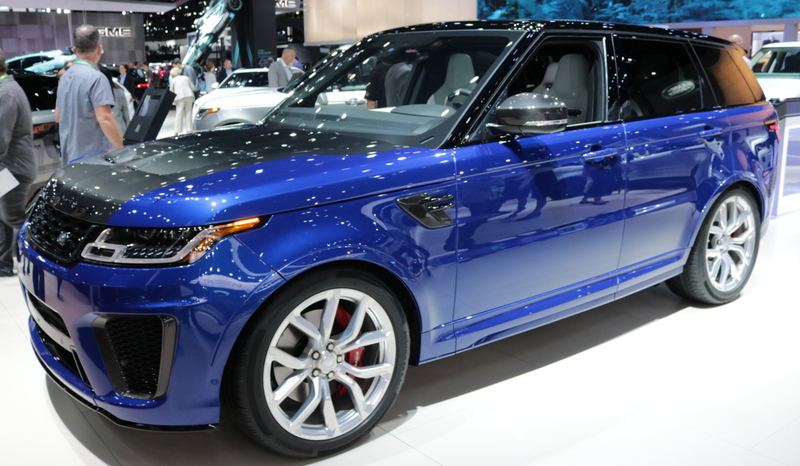 The refreshed Range Rover and Range Rover Sport were present, both in their most powerful renditions: SVAutobiography and SVR, respectively. 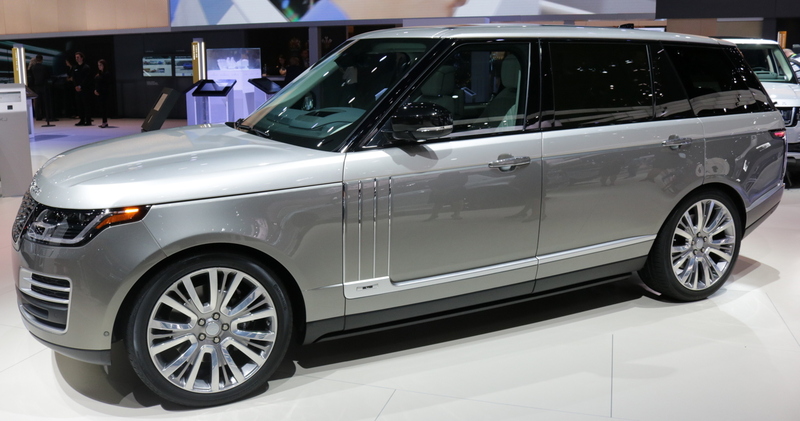 Range Rover Sport SVR is rated at 575 horsepower and the SVAutobiography Range Rover is rated at 557. Another face-lift for the NX. Turbo models are now labeled NX 300. 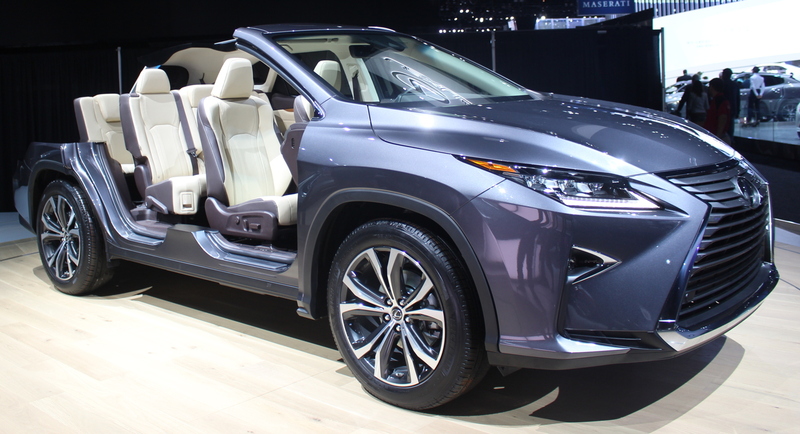 A little less than 4-and-a-half inches longer and with the same wheelbase, the RX finally offers seven passenger seating in its most popular vehicle. Due to the small change in dimensions on the outside, the third-row seat is minimal (23.5-inches legroom), but the turning diameter grows less than a foot. This facelift for the small Lincoln Ute gives it the new corporate grille from the Continental, but not a new non-MK-name. 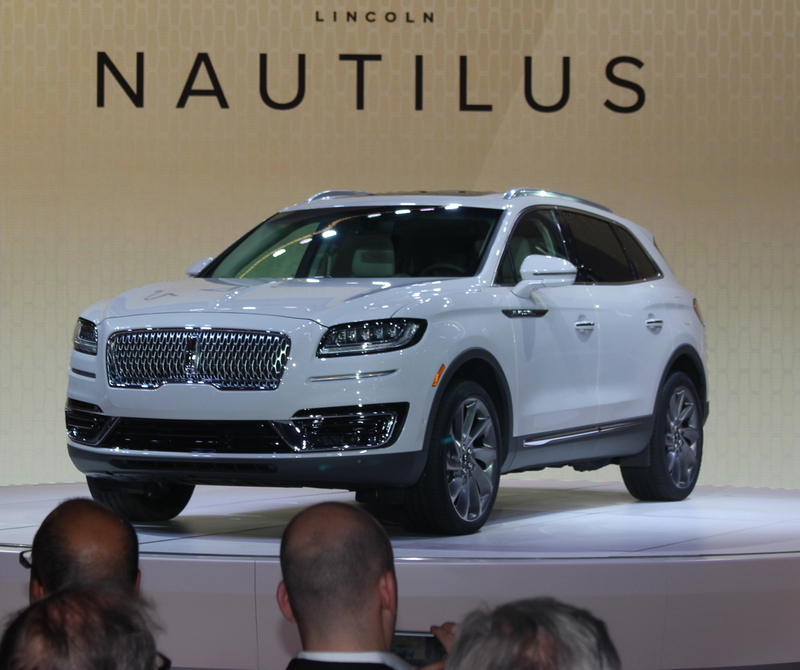 Biggest news is that the Nautilus is solid evidence Lincoln is leaving its "MK" naming scheme. The new corporate grille from the Continental is fitted, and a evasive steer assist feature if offered, which can help steer around obstacles if the emergency braking sensors determine they can't stop the vehicle in time to avoid a collision. 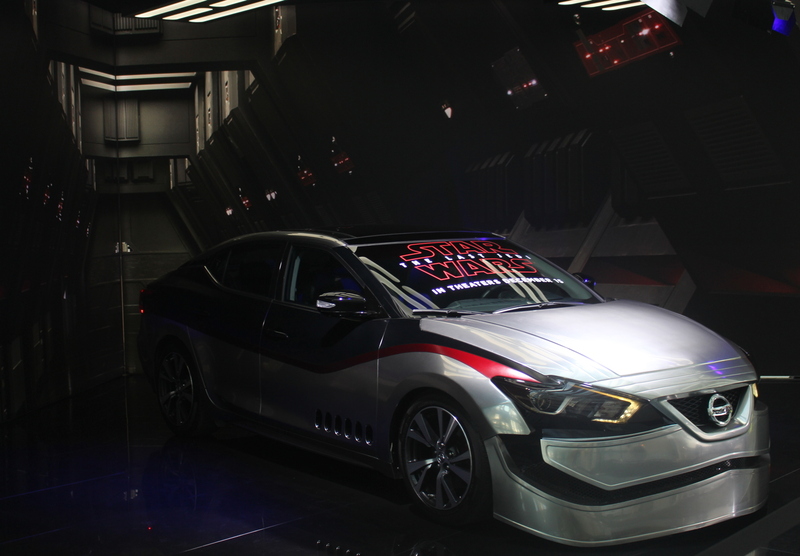 The refreshed Ghibli made an appearance at the show. 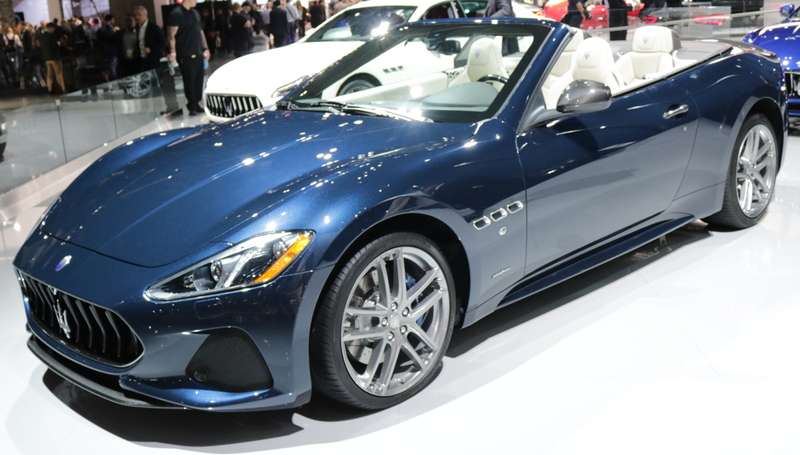 As well as the redesigned GranTurismo. The unveiling of the 2018 Mazda6 showed mild exterior changes, a new top-level Signature trim and a 2.5-liter turbocharged engine with approximately 250 horsepower (on premium fuel, 227 without). The standard 4-cylinder unit can deactivate its two outside cylinders to save fuel, a first in the United States. The chassis is reworked and now includes standard G-Vectoring Control, which minutely reduces engine torque when turning to put more weight on the steering wheels and give more lively turn-in. Greater noise reduction and a smoother ride are also promised. An all-new interior includes rich materials, especially on Mazda6 Signature. 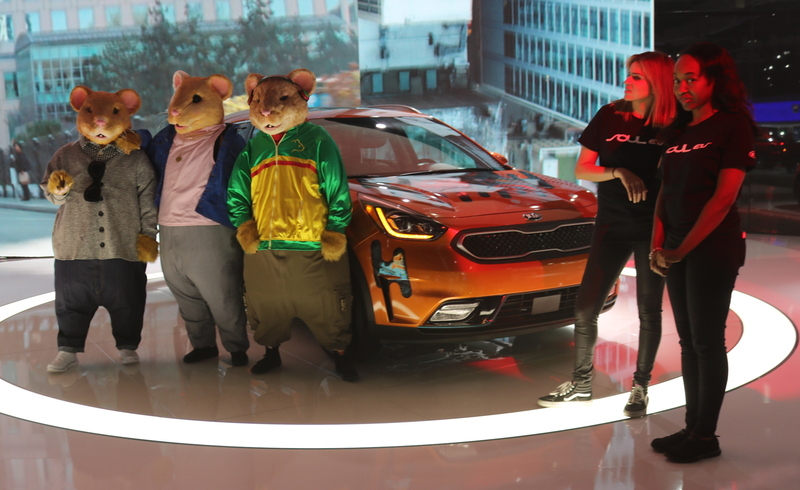 New features include available ventilated front seats, 360° View Monitor, windshield wiper de-icer, windshield-projection heads-up and stop-and-go capability for the optional Radar Cruise Control. 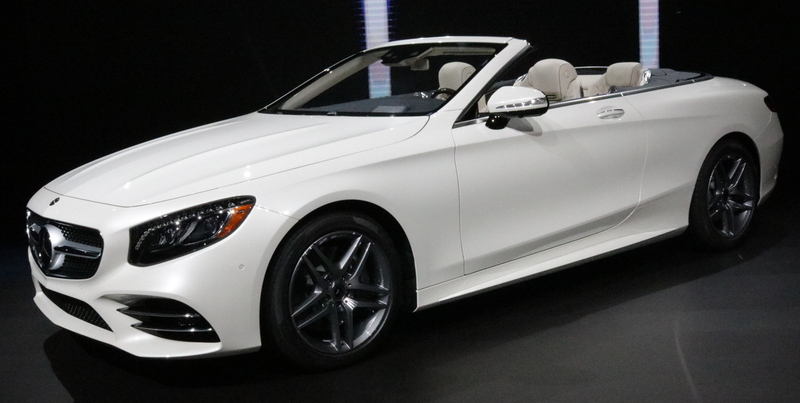 This was the U.S. premiere for the 2018 S-Class Coupe and Cabriolet, which add new grilles, new engines and other features. AMG models now get the 9-speed automatic. S550 becomes S 560 with a smaller 4.0-liter twin-turbocharged V8, but more horsepower (463). In the coupe, this engine uses cylinder deactivation to improve fuel mileage. AMG S 63 models also get a smaller but more powerful V8, also a 4.0-liter, but with 603 horsepower. The S 65 retains a 6.0-liter twin turbocharged V12. 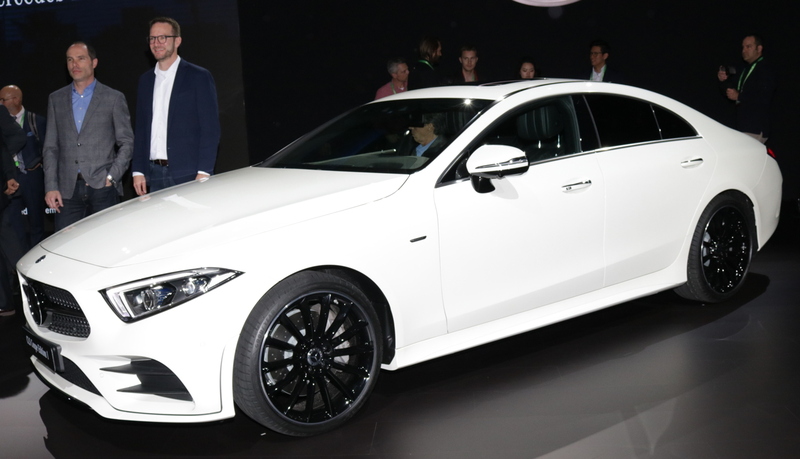 The newly redesigned CLS was unveiled for the first time in Los Angeles. 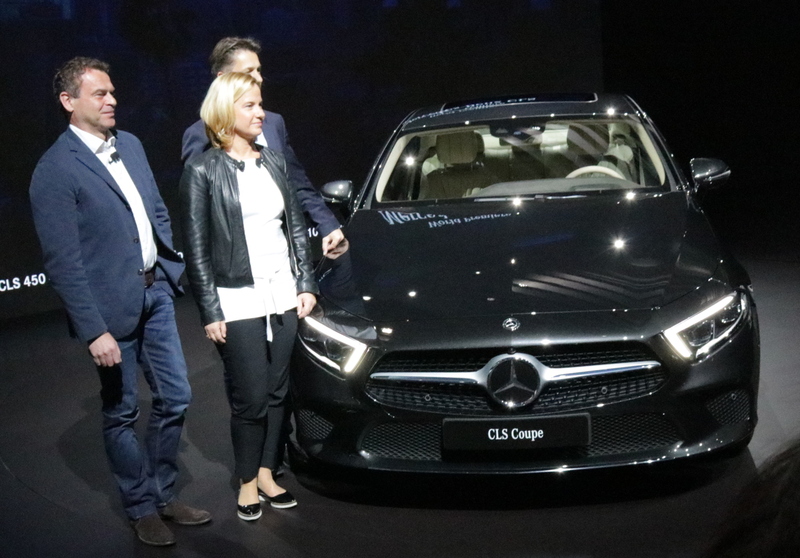 The new CLS will offer seating for five, a first.Its look is both cleaner and more aggressive. 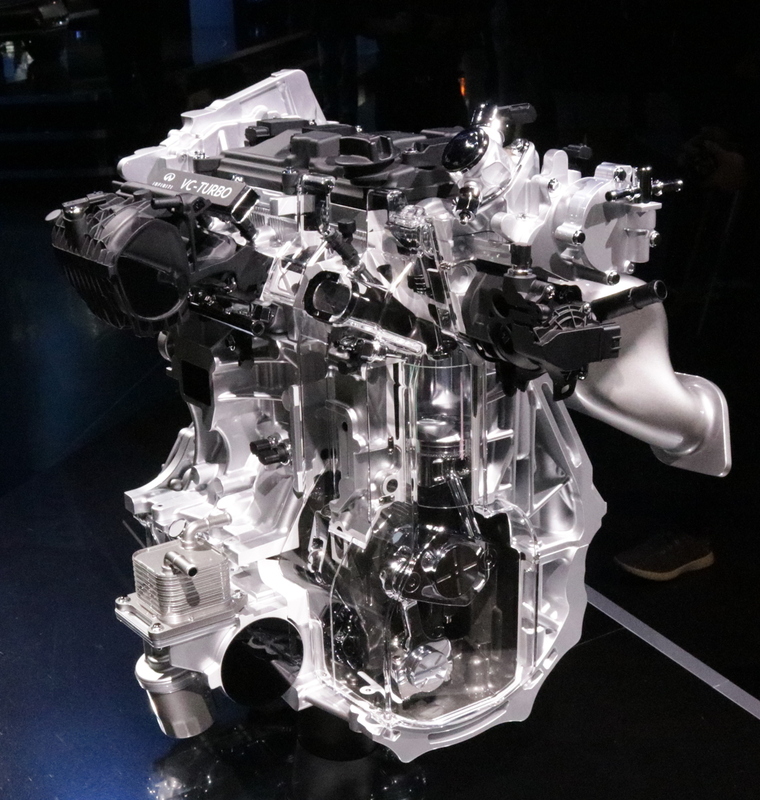 A new turbocharged inline six-cylinder (the first inline-6 in a Mercedes in the United States for decades) is a mild hybrid with 362 horsepower. It utilizes a 48-volt electrical system versus the conventional 12-volts to increase efficiency. It will be the engine in the CLS 450 and CLS 450 4MATIC. 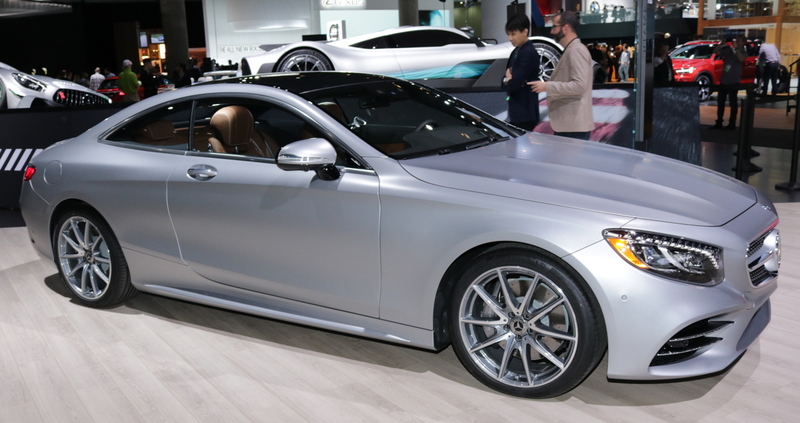 Later, V8 engines and AMG versions will be offered. Mitsubishi's newest crossover is attempting to cash in on Gen-X's fond memories of a sports car of their youth: the Eclipse. It will offer a turbocharged engine, but the 1.5 Turbo with 152 horsepower doesn't quite evoke the performance of the Eclipse GSX with its 2.0 turbocharged engine, especially carrying around another 800 pounds. What it lacks in sportiness, it makes up for in safety and technology. Blind Spot Warning, Lane Change Assist, Rear Cross Traffic Alert, Forward Collision Mitigation (automatic braking), Lane Departure Warning, Multi-View Camera System and Automatic High Beams are just some of what will be offered. A first for Mitsubishi, MITSUBISHI CONNECT will offer automatic calling of emergency services and other telematics services, similar to GM's OnSTAR. 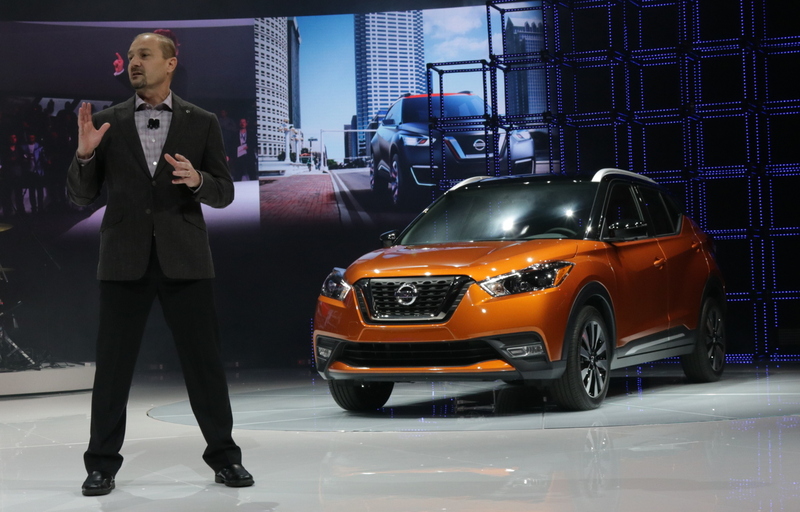 Everyone is rushing into the Mini Sport Utility arena, but this is Nissan's third entry. 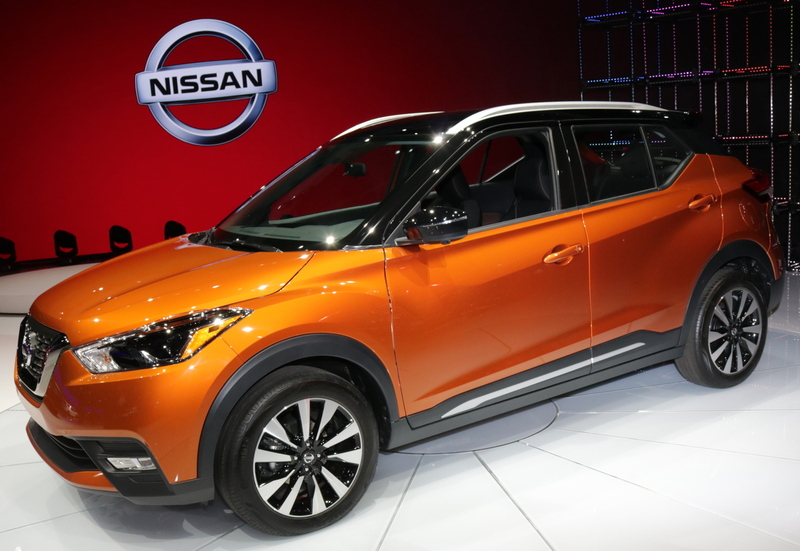 Bigger and less powerful than the sporty Juke, more playful than the Rogue Sport, the Kicks offers a 1.6-liter 4-cylinder engine (minus the turbocharger that the Juke gets) and a CVT transaxle. All-wheel-drive is not in the picture at this time. This seems to aim the Kicks squarely at crosstown rival Toyota's C-HR. 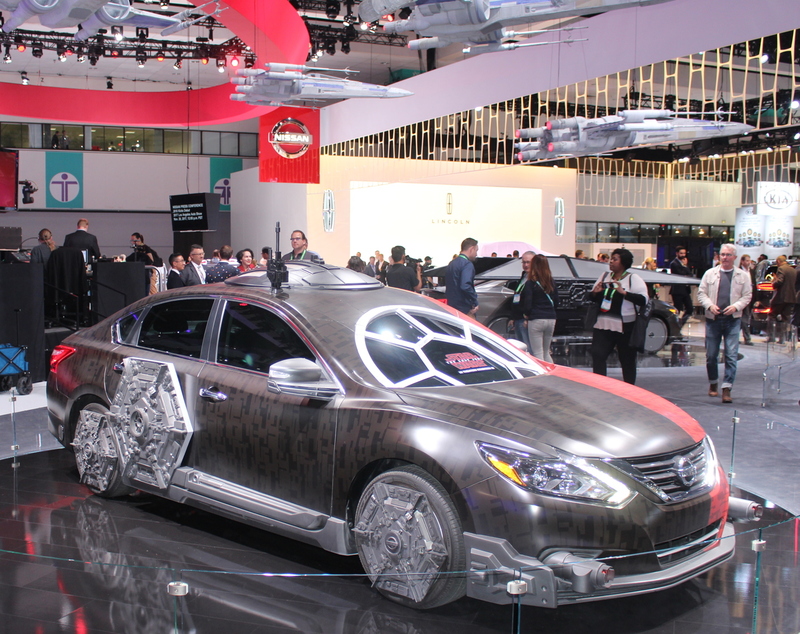 Nissan's strongest effort with the Kicks is its styling. Mimicking its big brother, the Murano, the Kicks offers a floating roof available in a contrasting color: black, orange or white, depending on the base color. Exaggerated wheel arches, swooping taillight lenses and a dark lower body trim with a metal strip all come together nicely. 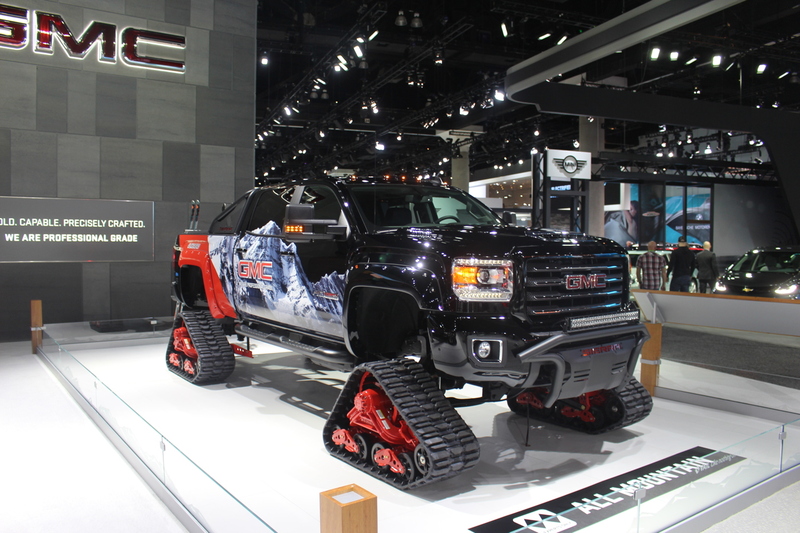 Expect 33 miles per gallon fuel mileage. The Kicks goes on sale in Spring 2018. 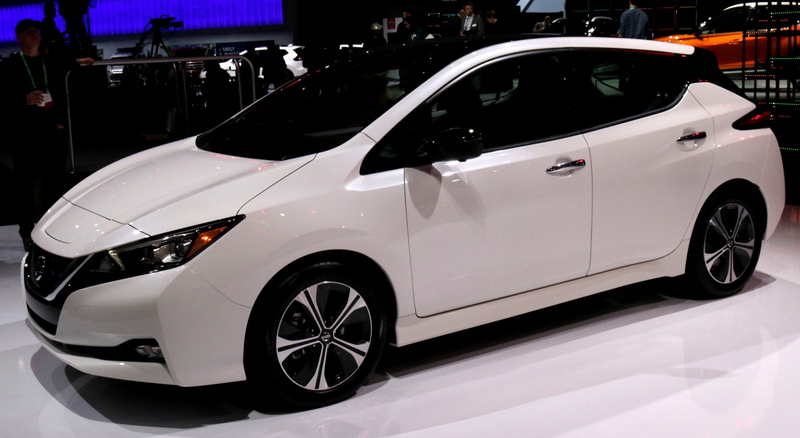 The redesigned all-electric Leaf made its Auto Show debut in Los Angeles. With much improved range (150 miles on a single charge) and available ProPILOT semi-autonomous driving gear, the Leaf is a major step on the road to an all-electric car future (if there will be one). 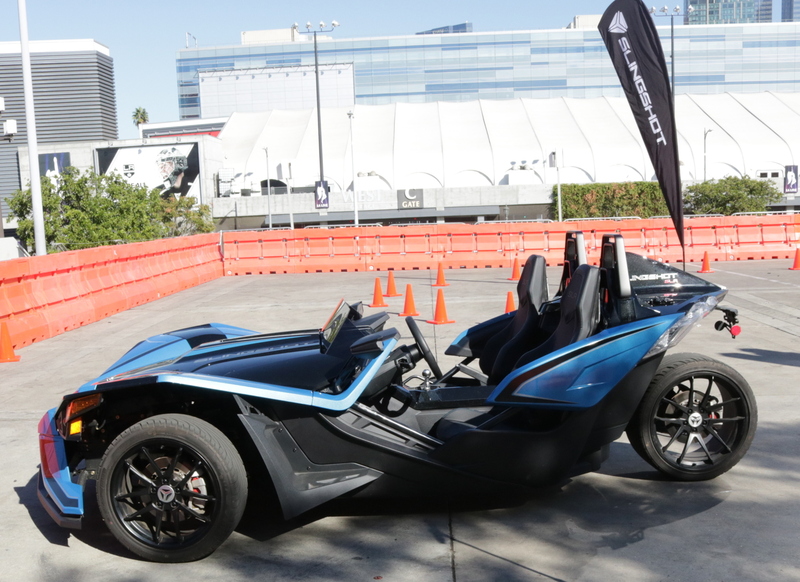 Car shows aren't just about cars, and legally the Polaris Slingshot is a motorcycle. With a General Motors powertrain directly from the defunct Pontiac Solstice (2.4-liter 4 cylinder with a 5-speed manual), this two seater is appropriately overpowered. 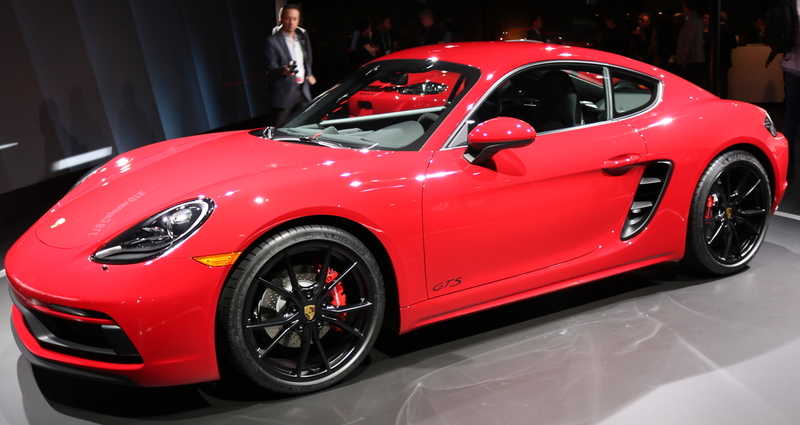 Porsche presented the most powerful versions of the Cayman/Boxster twins, the GTS. With 365 horsepower, the 2.5-liter 4-cylinder is the most powerful, yet. 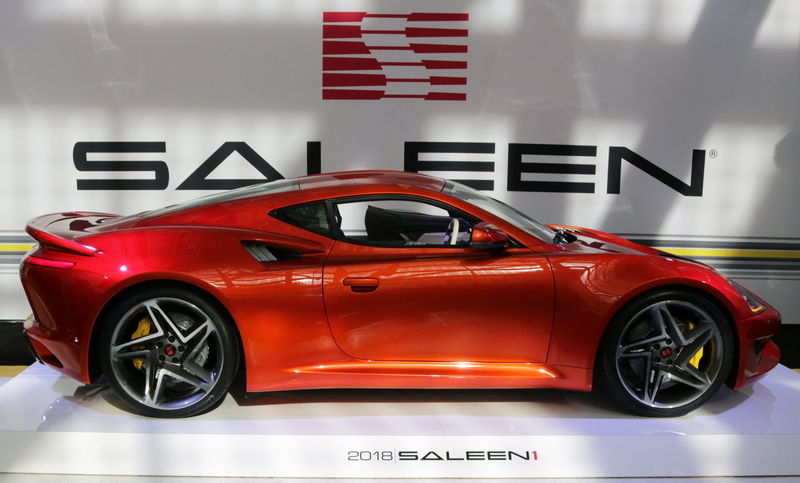 Steve Saleen's company unveiled their mid-engined Saleen 1. With a 450-horsepower 2.5-liter 4-cylinder engine, a six-speed manual and weighing only 2685 pounds, this will be a fast car. Top speed is estimated by Saleen Automotive Inc. at 180 MPH. Saleen usually modifies cars created by others, most notably Mustangs, but this is his own stand-alone creation, made from aluminum and carbon fiber, seating only two. It is being priced at only $100,000. This is a very important entry for Subaru. 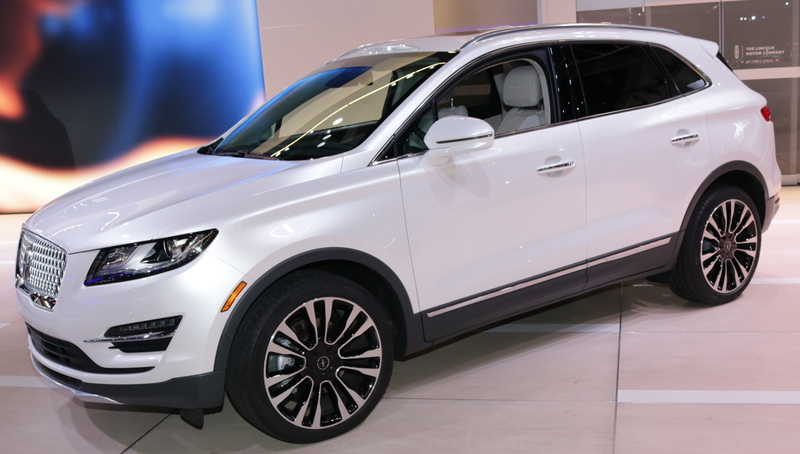 Riding a wave of increased sales records for years, this small company has failed to make a three-row SUV before (Tribeca B9). The Ascent is larger and more mainstream (sorry hipsters). 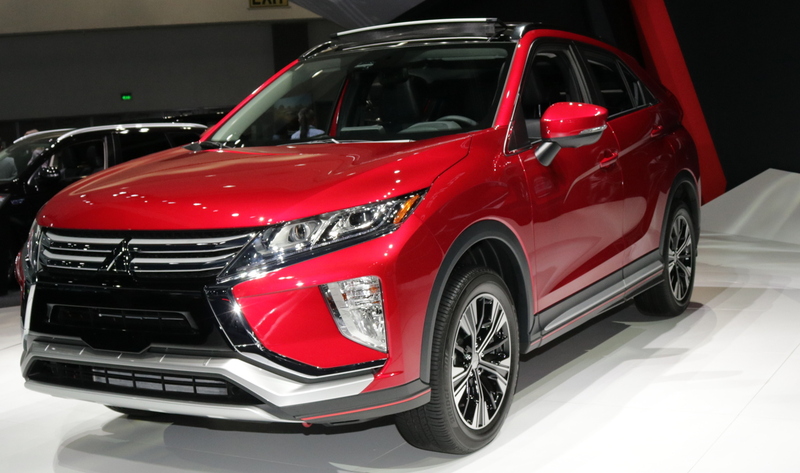 With a new, turbocharged 2.4-liter flat-four engine, featuring direct fuel injection and making 260 horsepower, the Ascent is poised to take on the Mazda CX-9 as well as big hitters like the Toyota Highlander and Nissan Pathfinder. 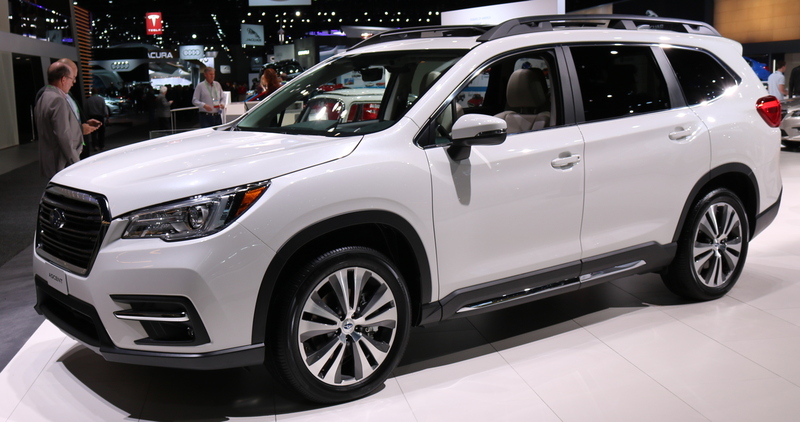 It will compete squarely with those and others, including a 5000-pound towing rating, another Subaru first. 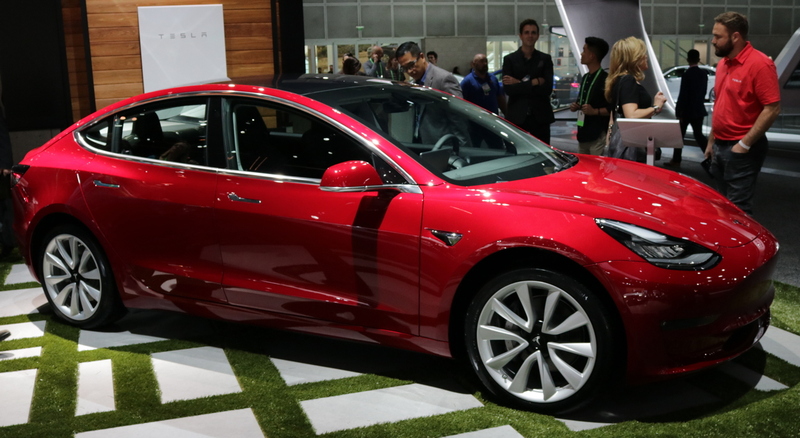 The LA Auto Show may be the first place many people can see the Tesla Model 3 in person. This first all-electric to be made by Tesla at a low price point (eventually at $35,000), it still has a range of 220 to 310 miles. Production is beginning slowly with lots of hiccoughs, but Elan Musk promises they'll be building hundreds a day soon. 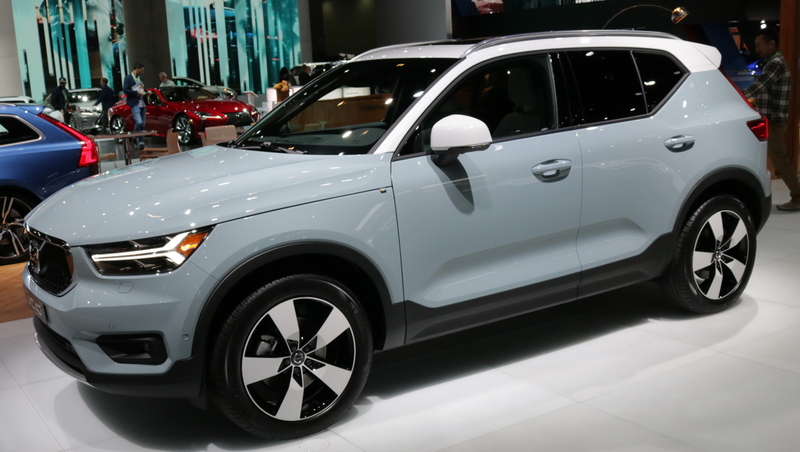 Following the trends of smaller Sport Utilities and two-tone paint schemes, the XC40 is due this Spring as a 2019 model with one powertrain: T5 turbocharged 2.0-liter 4-cylinder engine, eight-speed automatic and 248 horsepower. What would a car show be without show cars? 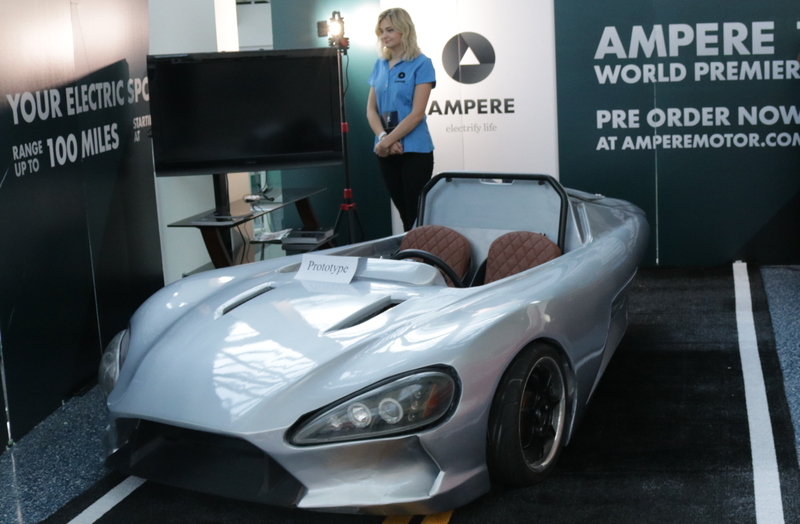 Only a rough prototype, the Ampere 1 made its premiere in the lobby of the LA Convention Center at the LA Auto Show. A three-wheeled vehicle offering a 100-mile range, the Ampere 1, if it is built, will not be required to meet car safety regulations. Another three-wheeled electric vehicle, the Arcimoto is more sorted than the Ampere 1 and promises deliveries start soon. Range on a charge is 70 to 130 miles depending on battery options and top speed is 80 MPH. 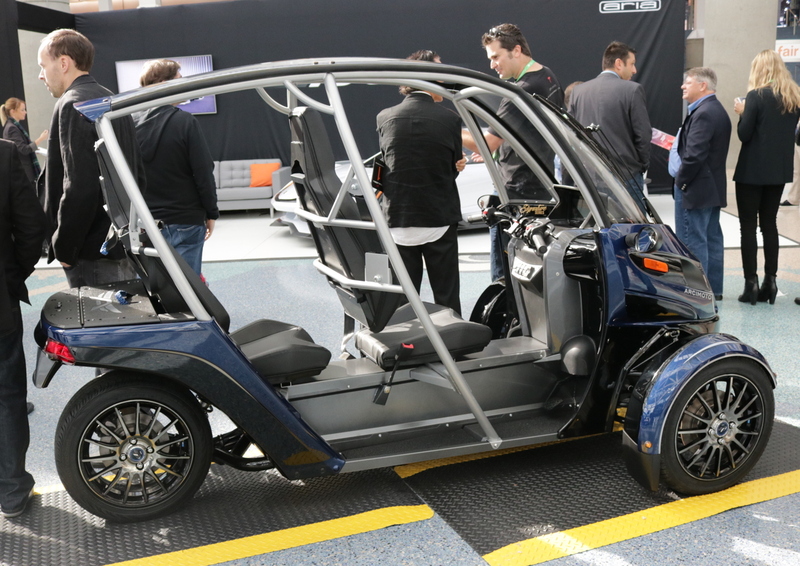 Arcimoto "Future I Drive," or "We really have run out of decent car names." Starting price $11,900. 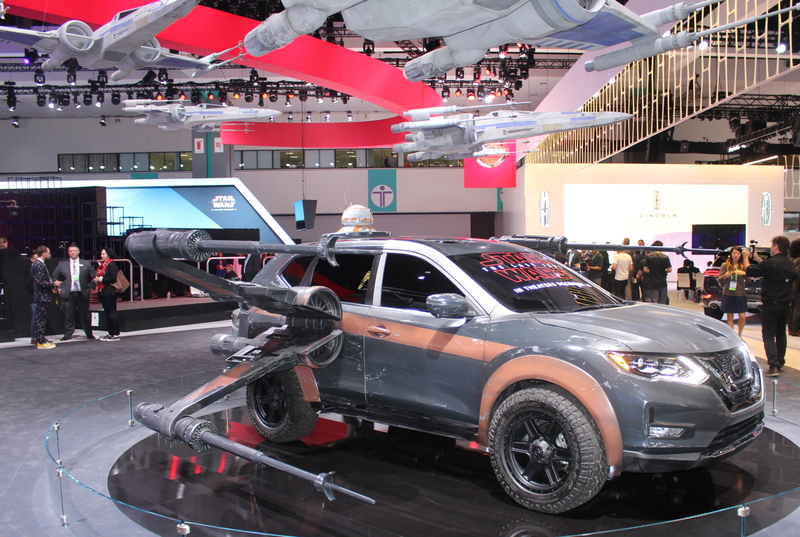 Aria, builder of concept cars for other makers and movie cars, is taking advantage of new car safety rules that require no crash testing of very low volume vehicles. Boasting 1150 (imaginary for now) horsepower from a supercharged GM V8 and two electric motors, the Aria is in early concept and prototype stages. Production, when and if it begins, will be limited to about 400 units. BMW is set to reintroduce the 8 Series as its flagship coupe, and the Concept 8 Series tests the waters for its styling direction. 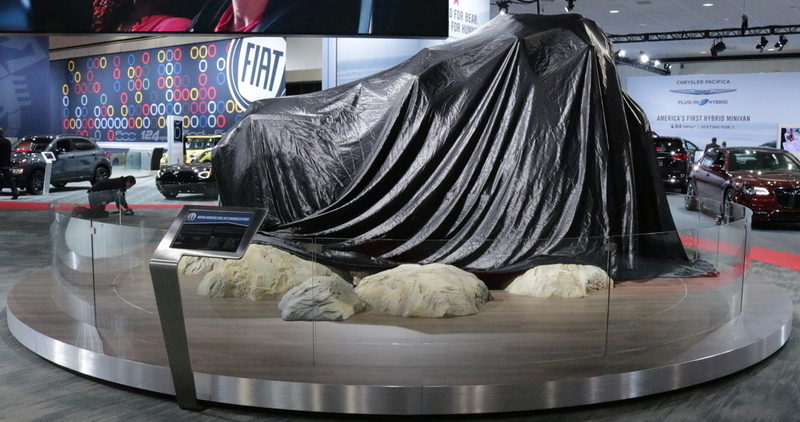 First seen in the U.S. at Pebble Beach, the LA Auto Show is its first U.S. Auto Show. 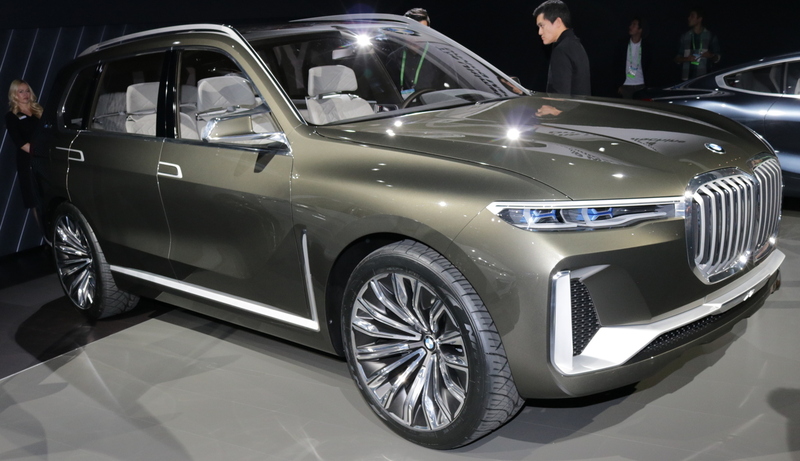 As BMW rushes to finally get a full three-row sport utility to market, the X7 Concept helps ready the public. With nothing to compete directly with the Mercedes GLS, Cadillac Escalade or even Acura MDX, the X7 is an important entry for BMW. Some concept cars are just exercises or marketing exploits. 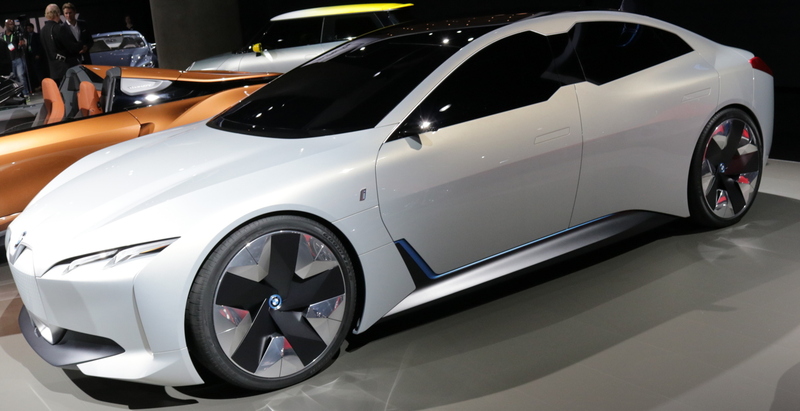 This concept hints at what will fill BMW's i-lineup beyond the i3 mini car and the i8 roadster. While some start-up car makers go the three-wheel route to duck full safety regulations, and others go the low-volume route, Bollinger plays the heavy-weight class card. With a stated GVWR (Gross Vehicle Weight Rating; weight fully loaded with potential payload included) of 10,001, the Bollinger is exempt from most passenger car safety regulations, including airbags and crash tests. All-electric, the B1 has a range of 120 or 200 miles, 360 horsepower and 472 lb-ft of torque from its dual front and rear motors, which give it all-wheel-drive capability as well. 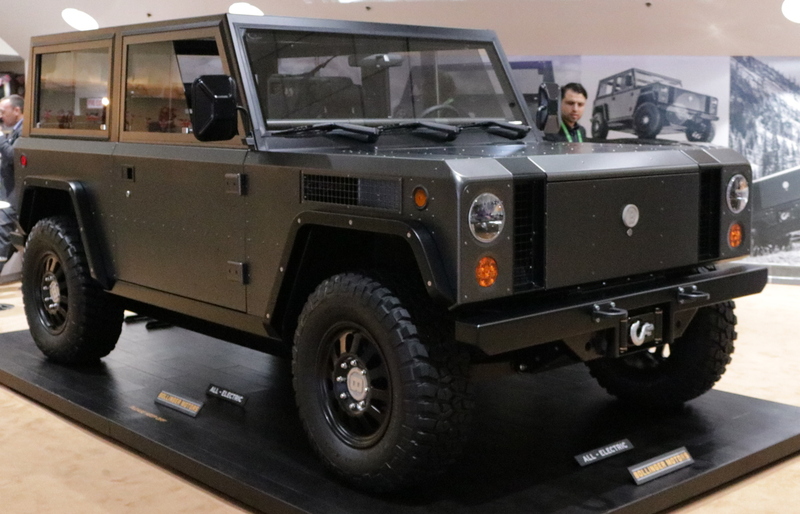 The Bollinger Motors Company is looking for manufacturing facilities, possibly with AM General, before it can start production of this work horse. A styling exercise, the Mazda Vision Coupe shows the essence of the styling direction and DNA of Mazda for the future. One can readily see the lines from a contemporary CX-9 for the new Mazda6 in this styling concept. The Vision Coupe debuted at the Tokyo Motor Show a month earlier, but Los Angeles is its premiere in the Americas. Debuting in Frankfort this September, the LA Auto Show is the Project ONE's U.S. premiere. A road-going race car for the street, it envisions a plug-in hybrid powertrain with over 1000 horsepower and speeds beyond 220 MPH. Four electric motors aid the turbocharged gasoline engine: 1 drives the turbocharger to eliminate turbo lag, another is linked to the crankshaft, similar to standard hybrids, and two more drive the front wheels to give this car de-facto all-wheel-drive without the weight and complexity of sending engine power to the front axle. 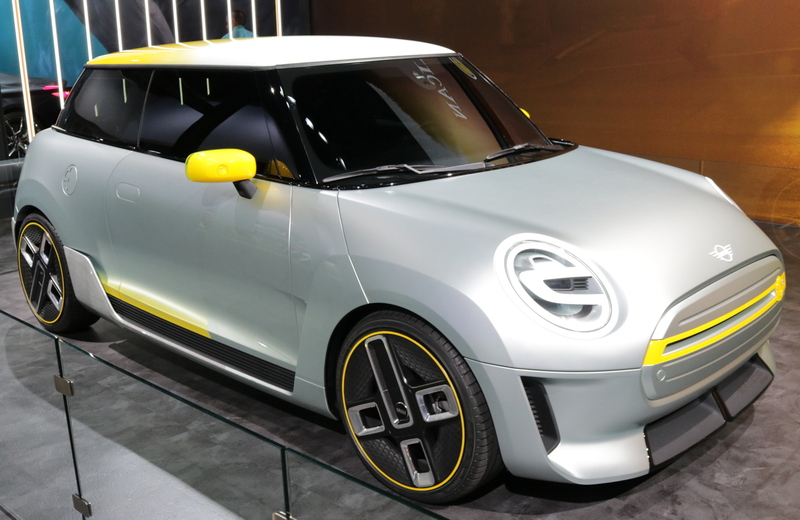 MINI will introduce an all-electric model in 2019 and this concept gives a preview of how MINI's stylists think an urban, all-electric MINI will look. 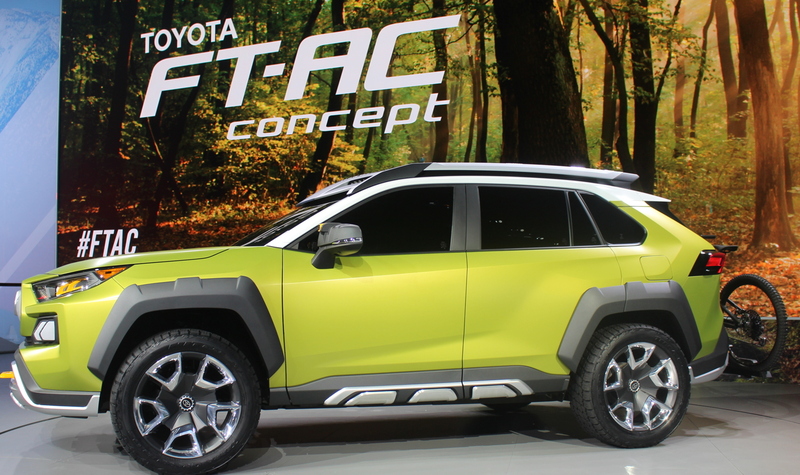 One of the most important concepts, this Toyota FT-AC Concept helps show the possible direction of Toyota sport utilities. After the passing of the iconic FJ Cruiser, itself a homage to the original Land Cruiser, the brand lacks a tough, small, sporty off-road appliance. Utility abounds in this concept: LED headlights, fog-lights that can be removed and used as flashlights, infrared cameras, and a rear LED light that can be remotely controlled all aid visibility. 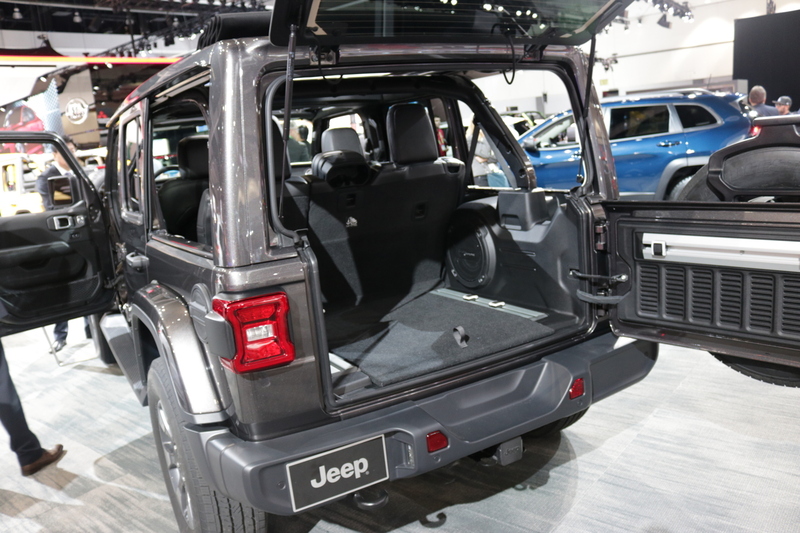 A cargo-rack on the roof expands cargo capacity, as does a retractable rear bike rack. On-board Wi-fi keeps people connected. And getting people anywhere is made possible with all-wheel-drive with locking differentials and variable terrain response. Okay, now we've officially run out of good new car names. 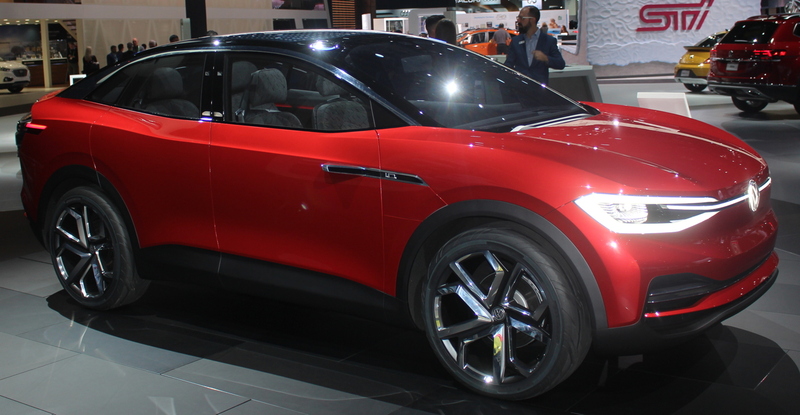 This concept for an all-electric sport-utility/sedan crossover uses rear sliding doors, which makes it more of a minivan/sport utility/sedan crossover. 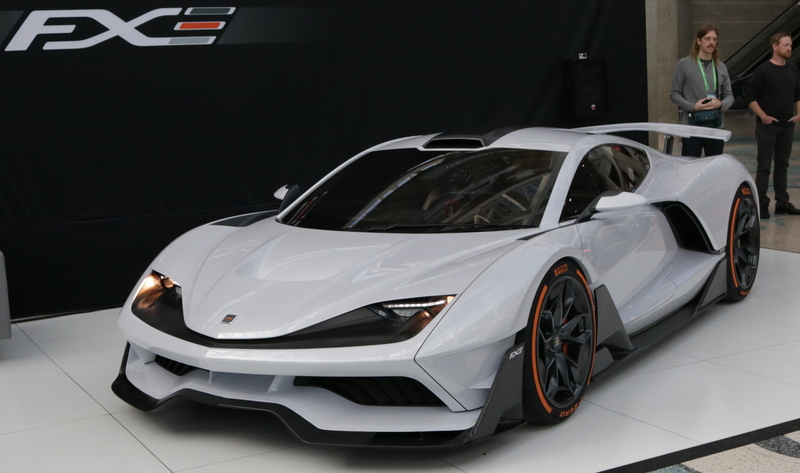 The concept is envisioned as having a 500 kilometer (310 miles) range. Other unique features include Volkswagen CleanAir System, an air quality and purification system, voice activated power doors, and fully autonomous "I. D. Pilot" driving mode.